This has been a whirlwind few months of events, activities, and amazing projects. We host our annual fundraising event in October because the spring is so filled with nonprofit events and because we love the feel of fall – warm yet hinting at cool weather to come, leaves turning and plants slowly settling in for a long nap. The perfect time to gather together and strengthen community bonds. And that is what we we have been busy doing! Mini Maker Faire: On Sept 13th Autistry hosted the Creation Station at the Greenbrae Mini-Maker Faire. It was a huge hit! Amelia, with help from members of the Autistry Support Network, created unique costumes, role-play weapons, creatures, and jewelry for children of all ages. The Autistry team worked with cardboard, hot glue, glitter and all sorts of other wonderful stuff to help make real the fantastical ideas that the children and adults brought to them. At the end of the day we realized that the Creation Station is a actually mini-Autistry! We have been asked to return next year and we most certainly will. 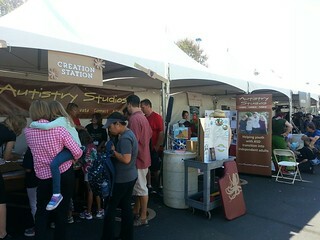 We can also take the Creation Station to other events. This Faire brought to you by: At the VIP Social Saturday October 18th for our major sponsors we turned the messy warehouse into an elegant fairy-lit dream world – complete with cardboard racetrack, white linen tablecloths and professional flower arrangements (thank you Mindy!). 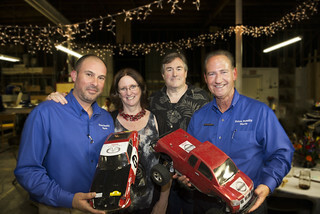 Our sponsors, Nissan Infiniti Marin, The Waite Family, Marin Sanitary Service, Presence Product Group, and the Murphy Family enjoyed racing the specially crafted remote control cars around the track. An exquisite array of hors d’oeuvres provided by Whole Foods of San Rafael followed by scrumptious lemon squares from Mariposa Baking Company fueled the race car drivers. Sara’s secret recipe sangria kept their spirits up. 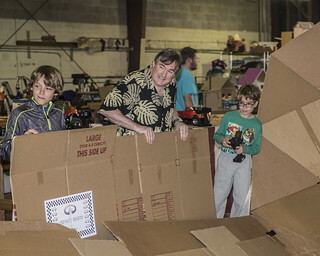 2014 Autistry Eco-Tech Faire: we used our powers for good! Our eco-friendly themed faire was a huge success. Not only did we raise a healthy amount for the Autistry Opportunity Fund we all had a great time. The racetrack was the big draw as kids large and small powered around the domes and flew through the straight away. This year we added the Obstacle Course where the low speed crawlers climbed over piles of debris in their attempt to reach the domes. Amelia’s Rainwater Reclamation Garden Shed was on display. With donations from The Urban Farmer Amelia created a shed perfect for these current drought conditions. 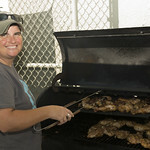 The Faire Food was also special – DeeDee Vierra of Renewable Energy Products brought down one of her Louisiana Pellet Grills and grilled chicken, sausages, and portobello mushrooms so tender that even the paper knives cut right through! Sara Gardner added her culinary touch with yummy salads! And, we have to send a huge thank you to Brook Leone and her sister Jordan for painting so many awesome faces. 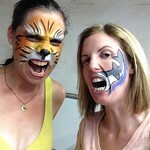 Lions and kitties and sharks, oh my! Coming up next: The Scientists & Artists…Party #3! Join us for science, art, and fun on Saturday, November 8th. 7pm at Autistry Studios. This is our biannual celebration of creativity. Party #3 presenters include Rachel Brem, PhD, Buck Institute on Aging • Ken Pontac, screenwriter and animation director • Cliff Saron, PhD, UC Davis Center for Mind and Brain and the MIND Institute • Artist and costume designer Angelique Benicio • PLUS a demo of martial arts from Al Loren and his students; and a human-sized Jenga game. And, yes, there will be karaoke!